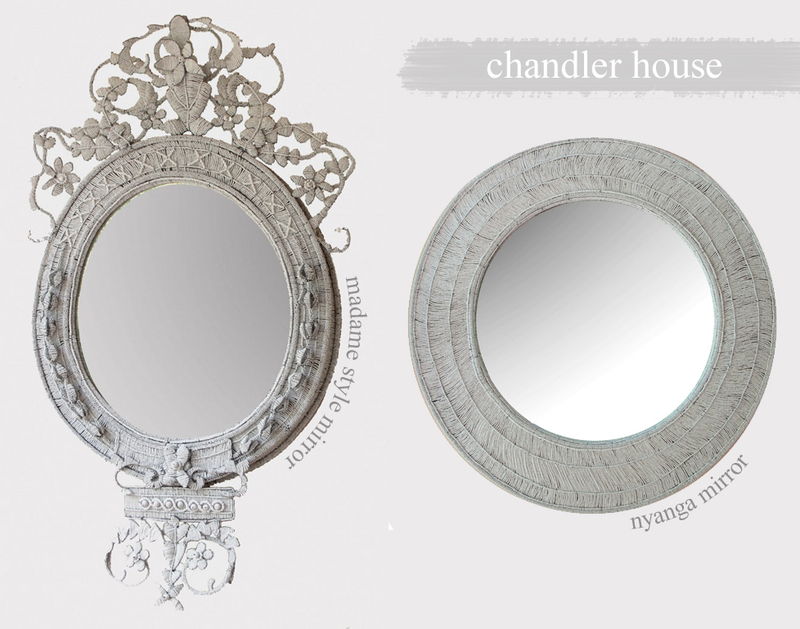 Browsing through the Chandler House website, Rose and I had to agree that Michael is one clever young man. Most of his pieces have an unique play of old and new – taking an artefact and reworking it into a contemporary interpretation is simply brilliant. He finds inspiration for new designs in South African history & heritage and then uses modern materials and methods to craft it. I also find it admirable how he utilizes otherwise damages & useless objects (like the shards of an old blue & white Dutch plate) to create something beautiful with it – with a completely different use. Fridge magnets made from shards of blue & white porcelain plates. Clever, hey! It seems Michael spend school holidays on family farms that resulted in an early introduction to nature, antiques, gardening and needlework. After leaving school, he enrolled at UCT where he studied one of his most passionate interests – Art History. While undertaking his post grad Michael started working for Stephan Welz & Sothebys, a prestigious fine and decorative arts auction house. 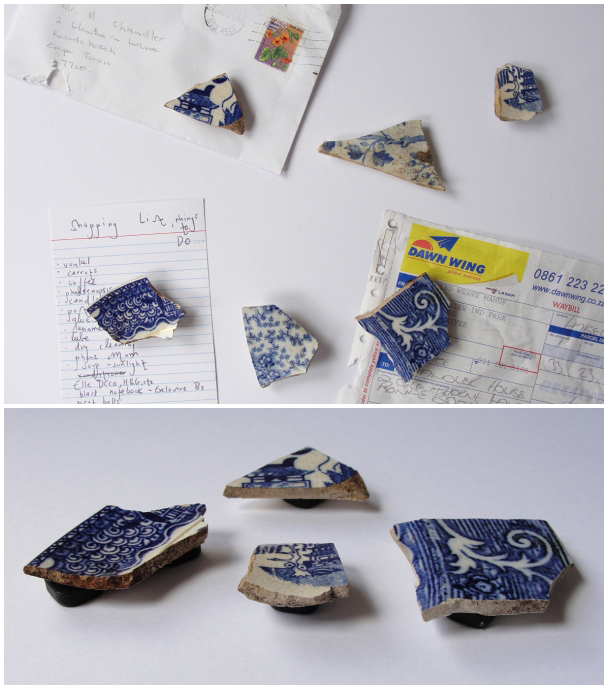 Spending every day examining and cataloguing beautiful things, he learnt an enormous amount about the past 400 years of design and was snapped up as a research assistant to Deon Viljoen – a leading expert on 18th, 19th and 20th Cape Visual and Domestic History. Deon’s passion for early Cape furniture and Dutch trade pieces quickly seeded itself in Michael and this is easily recognisable in the work that Michael does today. 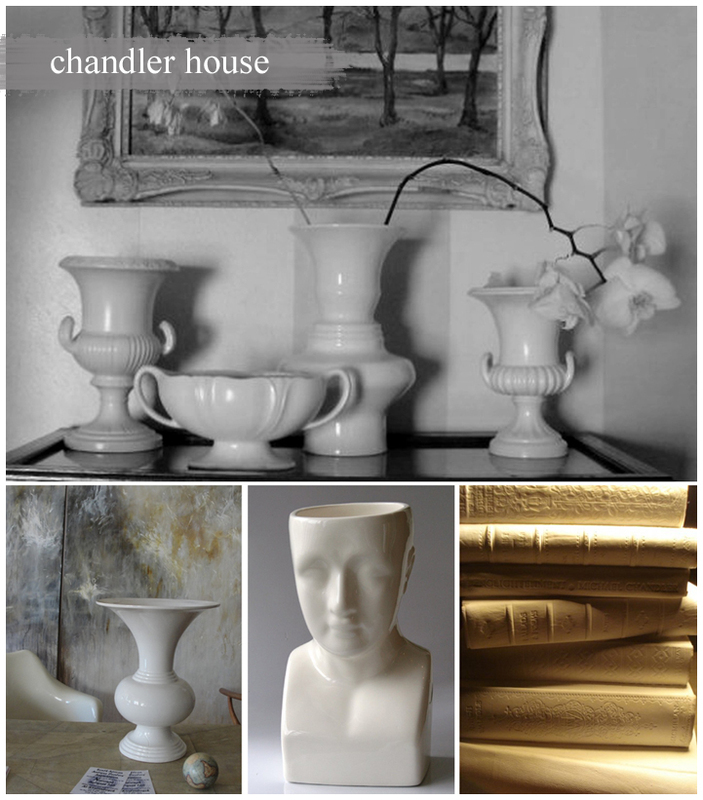 In July 2010, Michael started a small design studio – Chandler House – and his work is largely associated with the above-mentioned interests. 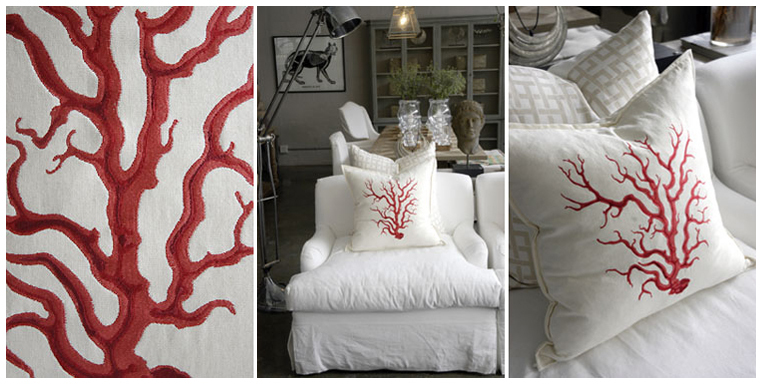 Beautiful embroidery - the white and blue combination remains stunning! Deon Viljoen approached Michael in 2010 to find an upholstering solution for these fabulous set of Cape Stinkwood Dining Chairs, circa 1810. Georgian English in design, but made in the Cape. 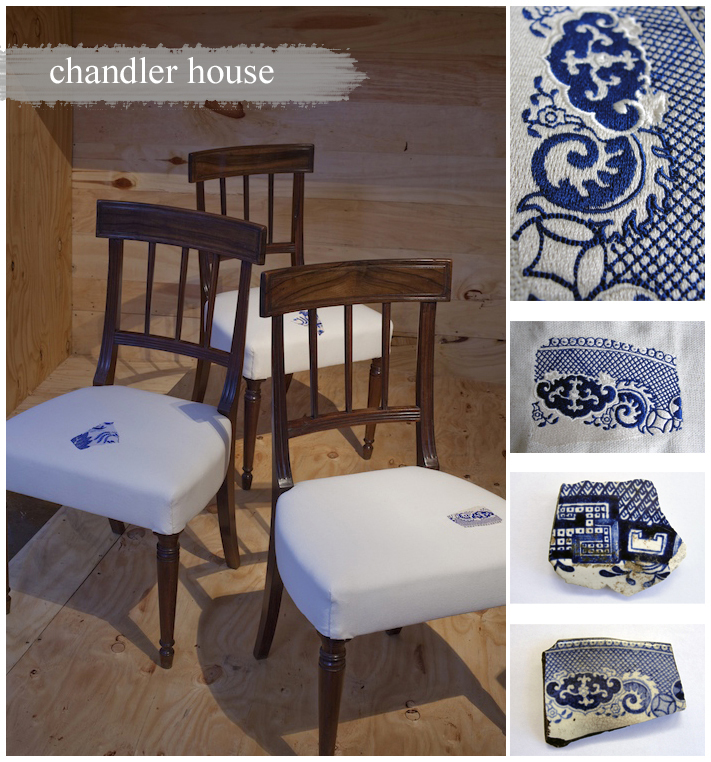 By some happy accident, Michael found shards of discarded English blue and white porcelain and decided to embroider the different porcelain shards patterns on the chair seats – brilliant blue on off-white cotton. 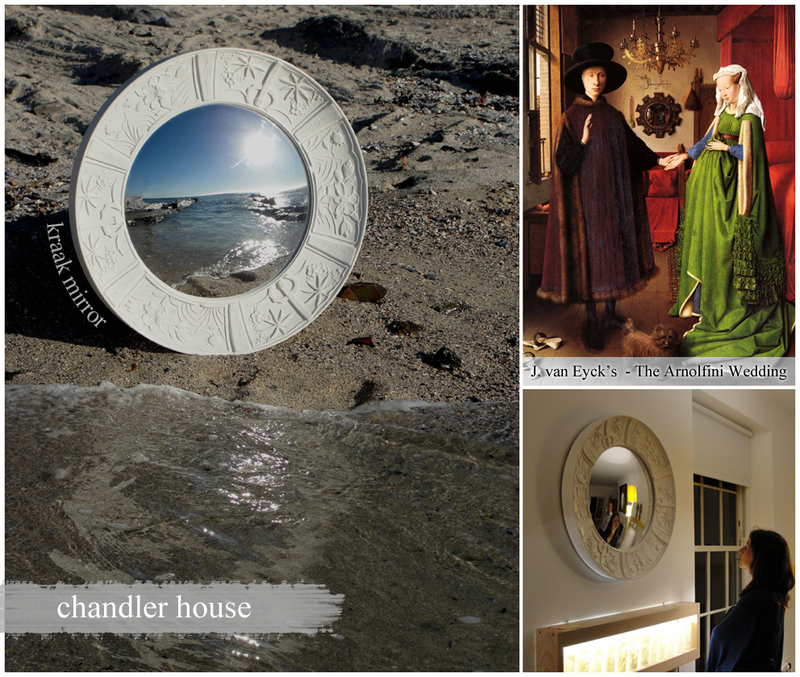 Based on the rim pattern of a 17th Century Japanese Blue & White Ceramic Plate, the Kraak Mirror, above, is a 21st Century Cape take on the Regency Butler’s Mirror. Love those busts. So funky! 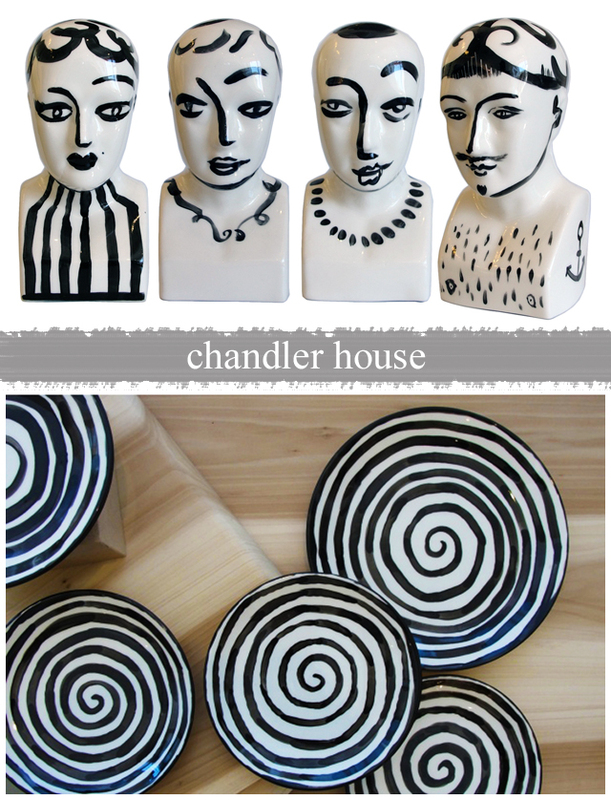 The beautiful black & white Houdiniware is quite… well… hypnotizing and the quirky busts you see at the top are slip-casts of a phrenology head by Lorenzo Niles Fowler. Michael, viewing the heads as blank canvases started experimenting by painting different features on the various heads – the result is uniquely funky. Based on a Robert Adam Neo-Classical design from the late 18th Century, the Madame-style mirror is made entirely out of white beads. Whereas the Nyanga Mirror has a more simplistic tribal feel – “nyanga” being the Xhosa word for “moon” and ultimately the inspiration for this beaded piece. On the bottom, from left to right: The Cape Spitoon; Phrenology Vase & the Enlightenment stack of books. The Cape Spittoon is Michael’s 21st Century interpretation of an old Cape Icon – although traditionally it would have been heavy brass, so unlike this dainty ceramic version. Here again you find the Fowler’s Phrenology head but now used as a vase – imagine planting some herbs in it – that would be one funky head of hair! I adore the stack of plaster books! 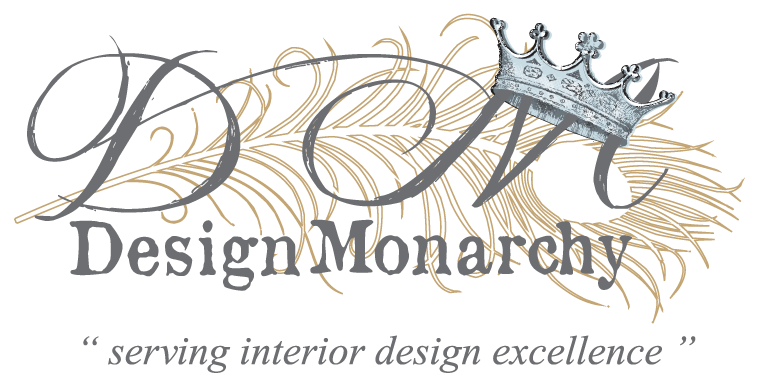 It can be used as a decorative object and Michael designed a lamp base version of it as well. Fabric man, David Bellamy kindly asked Michael to create an unique piece for an exhibition which aims to raise awareness and funds for the protection and survival of the Cape Parrot (Poicephalus robustus). Michael came up with this VOC-inspired piece, only replacing the traditional Ho-ho birds with a pair of Cape Parrots. Michael says he has several things in the pipeline. 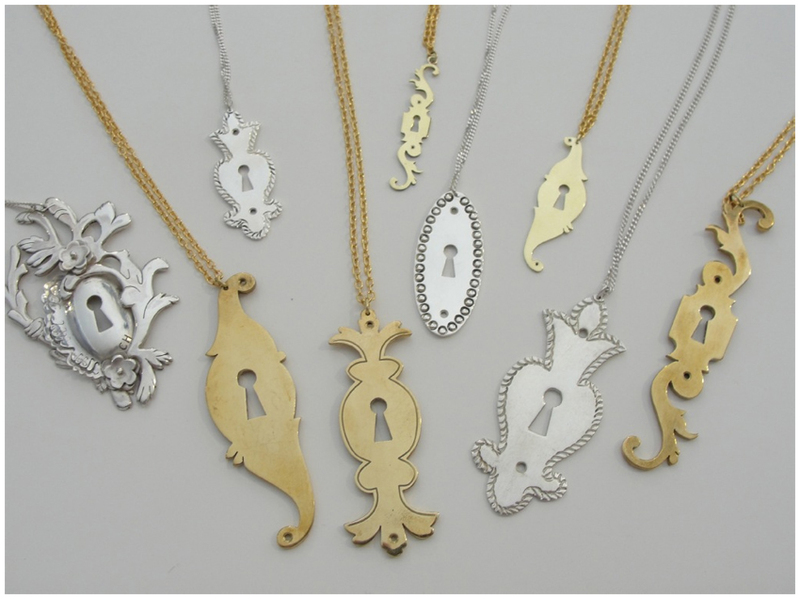 He’s working on a revised smaller Cape Pendant Collection – for those of you unfamiliar with it, it’s a jewellery range based on the key-plates found on old pieces of Cape Furniture (and it’s freaking beautiful). Lanalou also did a beautiful post about it here. 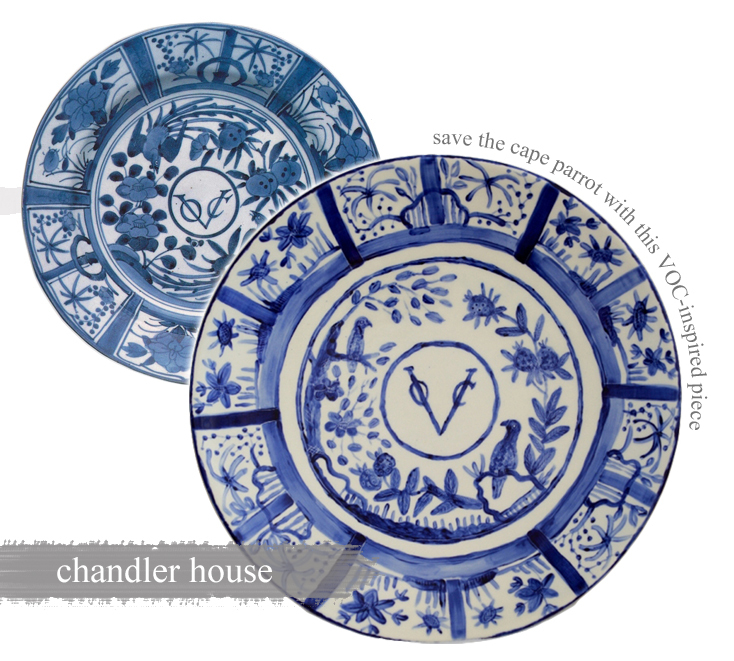 Michael is also currently focusing on a range of Kitchen Linens – Aprons, Tea towels, Dishcloths and Napkins inspired by china patterns, 18th century etchings of the Cape and esoterica. So, keep your eyes peeled people and check out his website for more beautiful thingies. So, what do you guys think? Which item appeals to you most? I have to say I would love to own one of those Cape Pendants, how about you? Give us your opinions please! I think Michael has done remarkable, original and beautifully executed work in the short while that he has started Chandler House. I am a great admirer of his work. I think that it is so exciting to have talent such as Michael’s not only in our country, but in our city. The flavour he adds to antiques with his contemporary twist should enable many to view the art of antiquity with new eyes. As for those ‘to die for dahl’ escutcheon necklaces – say no more! Having seen Michael develop his artistic skills over the past 10 years has been exciting. Great potential in the making. Looking forward to more and bigger events.